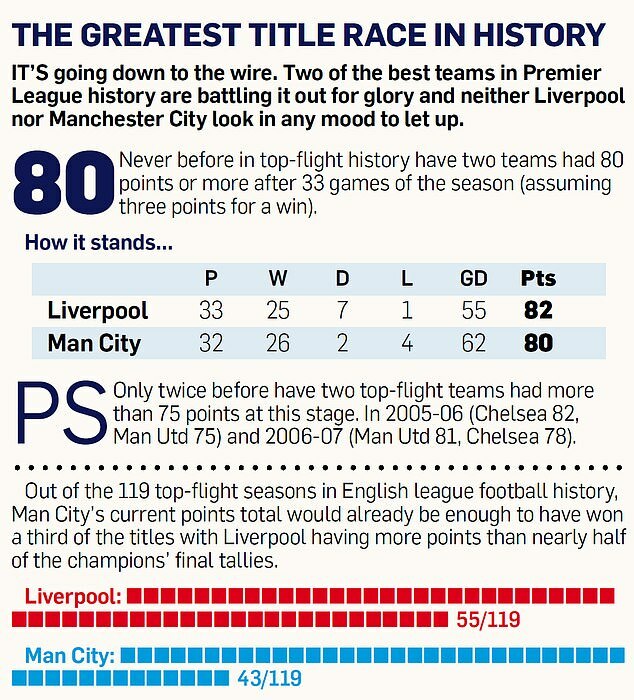 Manchester City and Liverpool play on the same day for the first time since February with the country split down the middle on who will be Premier League champions. 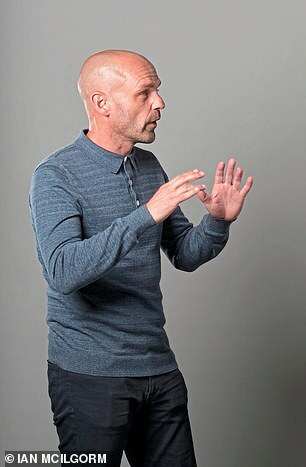 Mail on Sunday columnists Jermaine Jenas and Danny Murphy discuss the most exciting Premier League title race in years. 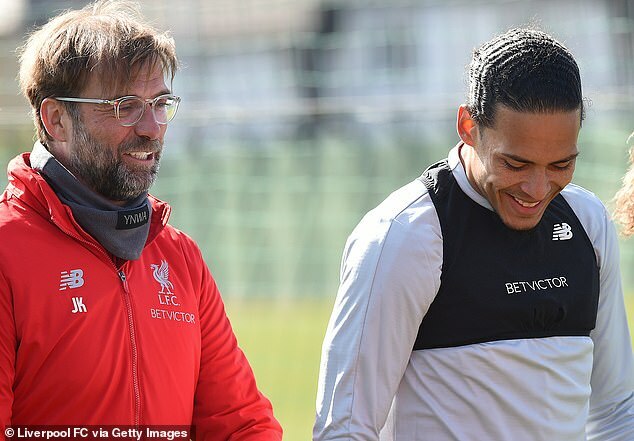 JENAS: One thing is for sure, the Liverpool players aren’t going to get away from knowing the City score even if they are focused on their own preparations. In this day and age, everyone will be telling each other what’s happening, including the stewards. MURPHY: I had some managers like Roy Hodgson at Fulham who didn’t mind us watching early games on TV in the treatment area. From memory, others like Gerard Houllier didn’t like it, particularly if the game on the box was relevant to us. He saw it as a distraction. JENAS: I wonder if Liverpool will be lifted by City’s performance at Spurs on Tuesday night. They looked a bit dull, and it was the same in the FA Cup against Brighton last weekend. Something didn’t seem right. 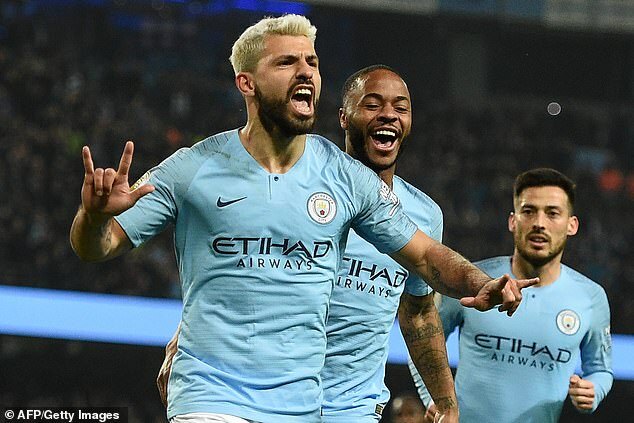 The million-dollar question is whether they are feeling the physical demands of four competitions or if Pep Guardiola has deliberately told them to conserve energy because of the fixtures coming up. If they play the same way against Palace this afternoon, they’ll be in trouble. MURPHY: City don’t lose many so when they do, there are always questions. If they’d gone for it at Spurs and lost, people would have criticised Pep for not learning from the Champions League against Liverpool last season. The only thing I was surprised at was bringing on Kevin De Bruyne and Leroy Sane in the last minute. That was a bit bizarre. No player can be expected to affect a game if they come on after 89 minutes. I don’t judge the Brighton game. Why would City run around like lunatics? If Brighton had equalised, I think City would have gone through the gears to score a second. JENAS: It’s ironic we are thinking like that because ultimately I think City will win the league and you are going for Liverpool. It shows how close it is between them. You can make arguments on both sides of the fence. Palace will not be easy for City on Sunday. They won at the Etihad in December and drew at Selhurst Park last season when Ederson had to save a late penalty from Luka Milivojevic to keep it 0-0. By City’s very high standards, that makes Palace their bogey team! MURPHY: I don’t think the previous Palace games will bother City too much but they will give Roy Hodgson’s team greater belief. If you get a hiding against a big club, you go into the next one thinking ‘here we go again’. Pep may even use the 3-2 defeat to his advantage, to warn about complacency. They won’t let Andros Townsend shoot again from distance. Can we get on to the big game now, Liverpool v Chelsea! You have to be impressed by the variation in Liverpool’s play, they’ve learned to sit back and protect. I remember Shaqiri being taken off at half-time against Southampton with the game won at 3-0. They have that option because Jurgen Klopp has players who are good at soaking up pressure. JENAS: Let’s agree to disagree! I don’t think shutting up shop suits Liverpool, even now. They got away with it against Porto on Wednesday but could have been caught out. Liverpool believe they are being pragmatic and smart but I think they are always better on the front foot. Sadio Mane and Mo Salah always stayed high up the pitch last season, they are dropping much deeper now and sometimes making a five in midfield. They tried it against Spurs. Yes, they won the game, but it needed a very late mistake from Hugo Lloris. MURPHY: But that’s a good reason why Liverpool will be so confident. As players, you can feel things during matches. Liverpool will always go to the final whistle because things are happening for them — Jordan Pickford’s mistake in the Merseyside derby, the dramatic own goal against Spurs. Whichever team wins the league hasn’t done it by luck because the consistency has been incredible. But Liverpool are using their momentum. Watching the last game at Southampton, 1-1 with 10 minutes to go but no panic from Liverpool. They believed. JENAS: You will be able to tell a lot by Sunday’s game against Chelsea and not only because of the Stevie Gerrard slip in 2014. I felt Liverpool’s win against Spurs probably had an impact on City and they would have thought that’s two points dropped. You create your own luck, Liverpool have taken advantage of every good bounce. MURPHY: Both teams have Champions League games next week so I don’t think it gives one team an advantage more than the other. City’s game against Spurs is obviously huge but Liverpool won’t take Porto for granted and they have to travel. I can’t see either Pep or Klopp resting many today. The next three points are too important. JENAS: The big conundrum for Pep is De Bruyne. I think City need him on Sunday. If he doesn’t play, Palace might nick a draw. 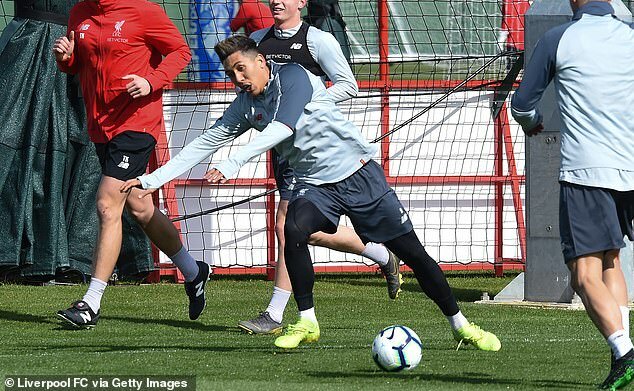 I’d play him, get the win, and then if he has to start on the bench against Spurs, bring him on with half an hour to go, fresh and ready to go again. MURPHY: Both sides have tremendous goalkeepers. Alisson and Ederson are equals in shot stopping and coming for crosses, but I’d give Ederson the edge on his distribution. He’s unbelievable with his feet. They are the Jennifer Lopez and Eva Mendes of goalkeepers, you’d take either given the chance. JENAS: Sounds like one of your comparisons, Murph! It surprises me Brazil start with Alisson. As a complete keeper, Ederson is better with his feet. MURPHY: Mo Salah played for Chelsea when they won 2-0 at Anfield in 2014. He’s a far better player now but one goal in 10 games is a worry because Liverpool don’t have the amount of goals from other areas that City have. Raheem Sterling hasn’t scored in four but Pep can count on Leroy Sane, Sergio Aguero, Bernardo Silva, Gabriel Jesus, nearly everywhere in fact. JENAS: Salah’s numbers are generally very good this season but he hasn’t hit the heights of last year. Players aren’t stupid, his opponents are going to adapt to try to nullify him, whether it’s doubling up or dropping deeper. He’ll keep battling away but it does alter confidence levels. MURPHY: The key game looks to be the Manchester derby on April 24. United fans might not want Liverpool to win the league but I’m convinced their players will be doing everything to beat City that night. I remember Liverpool beating Blackburn in 1995 when it could have stopped their idol Kenny Dalglish winning the league. 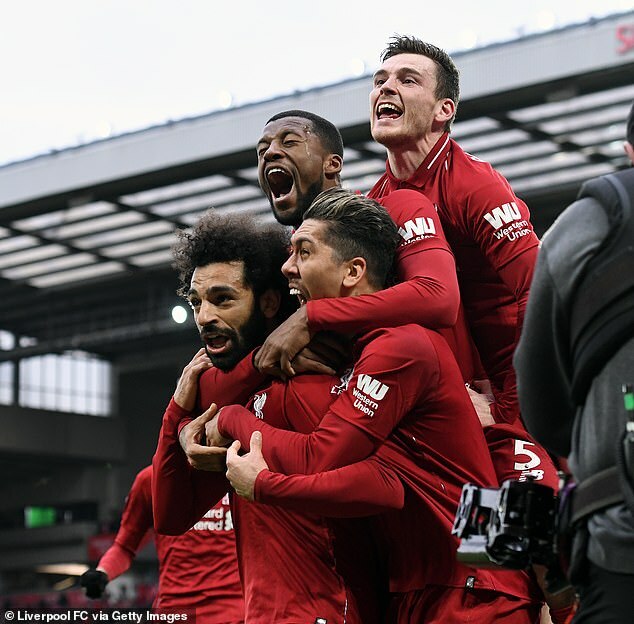 The fans were thinking ‘What are you doing?’ but the Liverpool players fought to win. United will be the same, particularly with the top four up for grabs. Old Trafford could be where the league is lost for City. 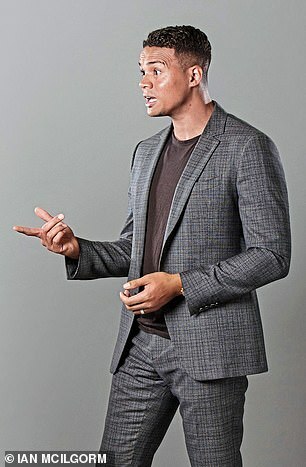 JENAS: I agree that United will go for it 100 per cent. 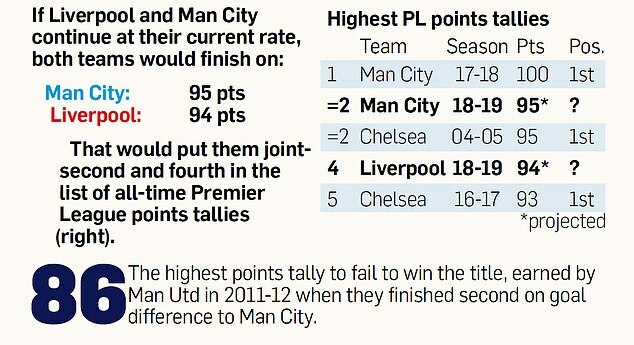 City’s response will depend on how much the two previous games against Spurs in the Champions League and Premier League have taken out of them. If they show the energy levels of the last couple of games, they won’t win. But Pep may be playing it very smart, asking his players to keep the ball rather than go for it during games so they can be sharp for the final month. It’s noticeable how often they are scoring early and then taking their foot off the pedal; Fulham, Cardiff, Brighton spring to mind. It could be Pep’s big trick — we’ll know in May if it’s worked.